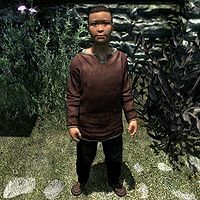 Kayd is a Redguard child and the son of Sayma and Beirand. He can be found running around in the city of Solitude with his friend, Minette Vinius. Like children in other cities, the player character can play tag with the two of them. He wears red colored child's clothes and a pair of shoes. He carries an iron dagger, the key to Bits and Pieces, a selection of food and toys, and a small amount of gold. Like several other residents of Solitude, he will attend Vittoria Vici's wedding, where he will mention attending the wedding of his aunt and how the cake at that wedding was bigger. Kayd distinguishes himself by being quite rude, with lines such as "I thought adventurers were supposed to look tough" and "I bet my papa could beat you up." He will also react with confusion to Vici's death, asking why someone would do that. This page was last modified on 27 March 2015, at 17:22.